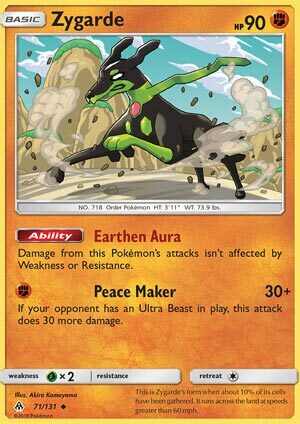 Zygarde 72 (FLI 72) is the best card no one is playing in the Forbidden Light expansion. It is the best single prize attacker coming out of this set. I’ve now played 103 games this month and 247 last month, and I have yet to come across Zygarde (FLI 72) even once. And no top finishing deck in any tournament played it either. Everyone has passed over Zygarde 72. This card is why I do these reviews on Pojo. I love Pokemon and I love writing and I LOVE discovering a card that nobody else has even bothered to give the time of day to. I went 15 W 7 L with this decklist. Even more impressive was my 9 W 3 L record against meta decks. And there are a LOT of meta decks on PTCGO right now. It’s clear that we all know exactly what the meta is: Buzzwole Sr. and Jr., Malamar and one or other of the Necrozma twins, and that Dark type Fox… although he’s seen A LOT less action (almost 50% LESS than before FLI). Baby Buzz is weak to Psychic. Baby Zy is weak to Grass. Did you see my statistical analysis of top finishing decks since FLI was released? Psychic energy was 36% of the 671 total Energy cards played. Grass was 1.5%. The percentage of Psychic cards played increased by 585%. Grass Energy decreased by 89%. The percentage of Golisopod GX dropped 93%. Tapu Bulu dropped 78%. Baby Buzz only gets its spif once per game. If you play a GX attack early (something very easily accomplished and amazingly beneficial when done turn 1 or 2 with Drampa GX), Baby Zy gets its spif every turn for the rest of the game. Baby Buzz has only a 25% chance of hitting 120 with its three attachment attack. Baby Zy starts at 120 if Drampa’s already hit its Big Wheel. Baby Zygarde’s single attachment attack has a 50% chance of paralysis. Buzz’s single attachment attack only gets its bonus if the opponent has exactly 4 prizes remaining. Again, not hard to take advantage of, but very unlikely to get that 90 damage bonus more than once per game. Zygarde 72 is a good card. I’d highly recommend you try it out. I think you’ll be pleasantly surprised like I was. I’ll admit I definitely whiffed on this card. It should definitely have been in the top ten. And then there’s the version boosting him to 50%. Zygarde is a Fighting Basic Pokemon, 130 HP, with a Grass Weakness, no Resistance, and a Retreat Cost of 2. Glare is a 2-for-20 move with a coin flip to potentially Paralyze the opposing Active Pokemon. Then there’s Calm Strike, which is a 3-for-60 that goes up by 60 more if you’ve used your GX Attack for the game. Well now that’s a little more like it. Calm Strike can have some extra utility and make Zygarde a good alternate attacker when combined with the right Pokemon-GX – Zygarde-GX being a pretty good candidate for that – while Glare has a 50/50 shot of being a neat stall tactic for a turn. Really the main appeal is in Calm Strike, and I think that that works out better for Zygarde at 50% than at 10%. That said, it’s still 3 Energy, and you do have to use your GX Attack before to get the value out of it. Arora Notealus: I think there should at least be a distinction between the forms when they’re not in EX/GX mode, just for anyone trying to fit them all into the same deck. Can’t really do that given the rule of 4, so it’s just a nice flavorful notion. Side Review: Heatran – good for a Metal Pokemon, good for an alternate attacker, probably not being used that much. I don’t even remember reviewing this card initially. Weekend Thought: What did you think of this week’s cards? Think there’s some room for these guys? Would you run the Zygardes with your Zygarde-GX? If you read the other CotD first, get ready for some deja vu. Part of doing them separately like this is basically giving permission to the writers – including myself – to repeat themselves a bit. Or a lot. We conclude the week not only by reviewing something other than a runner-up from the last countdown but two somethings. It is a twofer in the classic sense; reviewing two versions of the same Pokémon but without smooshing it all into a single review. First up is Zygarde (SM – Forbidden Light 72/131), a Basic [F] Type Pokémon with 130 HP, [G] Weakness, no Resistance, Retreat Cost [CC], and two attacks (“Glare” and “Calm Strike”). Glare requires [CC] and does 20 damage, plus has you flip a coin; “tails” means the attack just does the 20 damage while “heads” means it also Paralyzes the opponent’s Active. Calm Strike requires [FCC] and does 60 damage, plus another 60 if you’ve already used your GX-attack for the game. Being an [F] Type grants Zygarde access to useful support like Brooklet Hill, the Ability on Diancie [Prism Star], Strong Energy, etc. though there are a handful of effects that punish a Pokémon for being [F] Type (I’m don’t think any are currently competitive). 130 HP is no longer the max printed on non-Pokémon-EX/GX Basics, but it is still a good number, at least a little more likely to survive an attack than not. [F] Weakness is one of the more common forms of Weakness, and [F] Resistance one of the less uncommon forms of Resistance; exploiting Weakness is far more beneficial than slamming into Resistance. Zygarde’s own [G] Weakness isn’t the worst Weakness, but I’m hesitant to call it a “safe” Weakness. Even if they’re not consistently making the Top 8 or Top 16 or even the Top 64… they’re out there. You just have to run into one competently built and run by a competent player at some point before the Top Cut, and it could cost you. There were 732 Masters Division players vying for the top at the Regional Championship in Madison, WI this last Saturday (June 2nd), and while the only I can only confirm one [G] attacker in the Top 64, apparently there was an Alolan Exeggutor deck that showed great potential (but missed making Day 2). I am a bit biased, of course, as I want Alolan Exeggutor to become a competitive card. I’ve even finally started trying the deck myself on the PTCGO. No Resistance is the worst, except it is also the norm so it is just barely worth mentioning. Moving on, a Retreat Cost of [CC] is mediocre at best; I don’t buy that higher is better because of Heavy Ball, because too few of decks have made good use of Heavy Ball. It is just that anything greater than [C] requires you run more Retreat assistance or alternatives. Glare looks handy; 20-for-two is underwhelming on its own, but you can fuel it with a single Double Colorless Energy and the Paralysis might by you some time. Calm Strike isn’t totally worthless before using your GX-attack; it still hits [F] Weakness okay and it can even use Double Colorless Energy (or similar off-Type Energy acceleration), just like Glare. You do need the bonus for it to become a “good” attack. Yes, “good”. Of the available lists from this past weekend’s Regional Championship in Madison, WI, I’m not seeing anyone using Zygarde, but perhaps they ought to be? Buzzwole-GX seems to have settled on Buzzwole (SM – Forbidden Light 77/131), and when a deck is running Ultra Beast support that makes sense. Malamar (SM – Black Star Promos SM117; SM – Forbidden Light 51/131) decks seem to be running Marshadow-GX, though I’m basing that on very few examples. 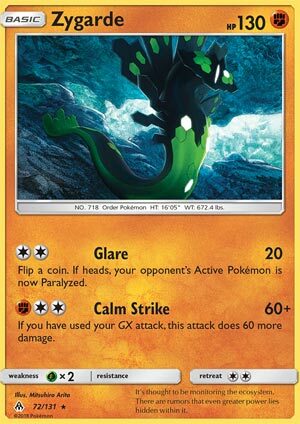 If [FCC] is something your deck can handle, especially if you aren’t running Ultra Beast support and don’t want to attack using something worth two Prizes, the only reason to not use Zygarde is that your deck saves its GX-attack for mid-to-late game. While a niche use, it is one Zygarde may grow to fill well. I think it applies to the Expanded Format as well. Zygarde isn’t as great as you’d like for Limited Format play; you’ll probably have nothing that can use your GX-attack, so Calm Strike is just a 60-for-three. That HP is more useful, however, as is the splashable nature of the attacks. Today, we’re looking at two cards: Zygarde (SM Forbidden Light 71/131) and Zygarde (SM Forbidden Light 72/131). The reason that I looked into two cards is to save some room for COTDs and the review crew did just that two years ago on XY Fates Collide. They’re both Basic Fighting types that are weak to Grass. Being a Basic is the best stage due to being put into play and saving deck space as opposed to Evolution cards. Fighting types can hit a variety of Pokémon for weakness that is found on some Colorless, Darkness, and Lighting Pokemon as well as having support such as Diancie Prism Star and Strong Energy for damage output, or Maxie’s Hidden Ball Trick or Korrina for search. Grass Weakness isn’t too bad at the moment: against Golisopod-GX the damage output is overkill, but the support Pokemon like Virizion-EX can actually pose a threat. We’ll start with 71/132. It has 90 HP and a retreat cost of one. It’s ability, Earthen Aura, makes this Pokemon’s attacks not affected by Weakness and Resistance. While you can ignore resistance so that you can deal consistent damage, not being able to double the damage makes it underwhelming. It’s only attack, Peace Maker, does 30 for F, plus 30 more if the Defending Pokemon is an Ultra Beast. Considering our targets, that would be a 3HKO or 4HKO against the bulkiest Ultra Beasts, like Guzzlord-GX or Naganadel-GX clocking at 210 HP. The attack isn’t that bad, unlike the Hawlucha (XY Furious Fists) blatantly bad Flying Press attack, which is sort of a all or nothing attack; you can still deal some damage if such a target isn’t present. It’s one of those cards which will like to have its ability offline so that you can deal double damage. It’ll sit nicely with Garbodor’s Garbotoxin or Alolan Muk. That be quite some investment, ability denial and damage boosting cards, but it’s not impossible to do. Now we get to 72/131. It has 130 HP with a retreat cost of two. Glare costs CC for 20 damage, plus a coin flip. If heads, the Defending Pokemon is Paralyzed. Calm Strike does 60 for FCC, plus 60 more if you’ve used your GX attack. Both attacks makes Double Colorless Energy effective, which can let you use Glare right away and not too far from using Calm Strike. Max Elixir, despite being about to leave rotation, can help you get to Calm Strike, skipping the need to use Glare. To make the most out of this second attack, you’ll need a GX Pokemon that benefits from using it early game. Solgaleo-GX and Drampa-GX are good examples. Neither Zygarde wou’t be the focus of a deck on its own, except being a tech on certain decks that will need those.